What do you get a nine year old for his birthday? Toys have become babyish. Gaming systems and tablets are too consuming and addicting. In our home, we encourage hobbies that involve the outdoors or that are lucrative. We don't do allowances in our home. It might work well as a motivator in some families but we have chosen to allow our children to find opportunities outside of their chores to make money. I have noticed that my oldest is very careful how he spends his money. I am convinced that it is because a majority of the money he has in his wallet is his own hard earned cash. One of the ways that he adds cash to his pockets is by scrapping metal. He used to help his dad and get paid a portion of the profit. Now, he will tear apart old televisions on his own and get the money for the metal, himself. Needless to say, when he received a Tesoro Metal Detector for his birthday the first thing out of his mouth was, "am I dreaming?!" He was beyond excited. He kept telling us that this was the best birthday gift, ever! He dreams of finding jars of gold hidden by a tree or old coins worth a fortune. 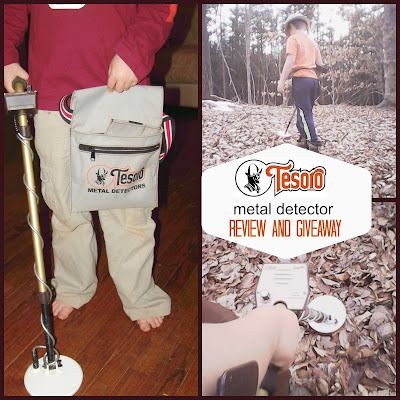 My husband was skeptical about the Tesoro Metal Detector. He wasn't convinced that it was going to do anything but find us pull tabs and nails since this metal detector is fairly inexpensive. Fortunately, he was proven wrong! After the first couple of times taking our son out in the backyard, he was pleasantly surprised at how deep it could pick up a signal. We still have plenty of ground to cover on our own property but we look forward to taking it to local lakes, the ocean and other sites nearby. He and our boys were outside for over an hour the first time they used it and enjoyed every minute of it. Pictured below are some of the finds from the first two hunts with the Tesoro Metal Detector. In addition to large chunks of random metal and a stake for tying out goats that we've been missing for a while, my son found some tweezers, a dog collar buckle and eleven cents. He was happy with his finds! The Tesoro metal dectector that we got was the Compadre model which sells for a reasonable $189. Tesoro products are made in the USA and have a LIFETIME GUARANTEE! When you order your metal detector you will receive a list of things that the lifetime guarantee does not cover. This includes obvious misuse or if you attempt to modify it. Honestly though, for the average person, you really wouldn't even need to try to modify it (if you knew what you were doing!) because it works really well! If you are looking for a stronger model that you want to use under water or in all terrian situations then be sure to check out their website for more Tesoro models. It runs on a 9V battery and is perfect for a beginner but also enjoyable for a seasoned treasure hunter. It is simple to use and is easy to find small targets with it. Once my husband taught my son the ins and outs of the detector and showed him how to care for it, he was then able to go out on our property on his own with it. The discrimination for different metals is quite accurate which makes it easy and fun for kids and adults alike. The entire detector cannot be submerged in water but coil can if you are searching for treasure in shallow waters. The whole family has been entertained with this detector. 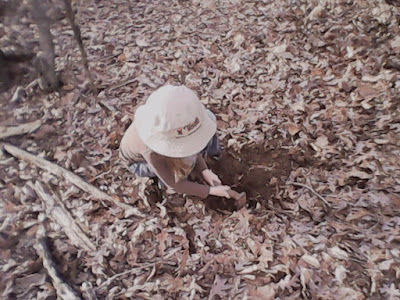 They have enjoyed going out and searching, digging and cleaning up their finds. Even if it's only an old soda can they find, they feel proud that they can help clean up the property. 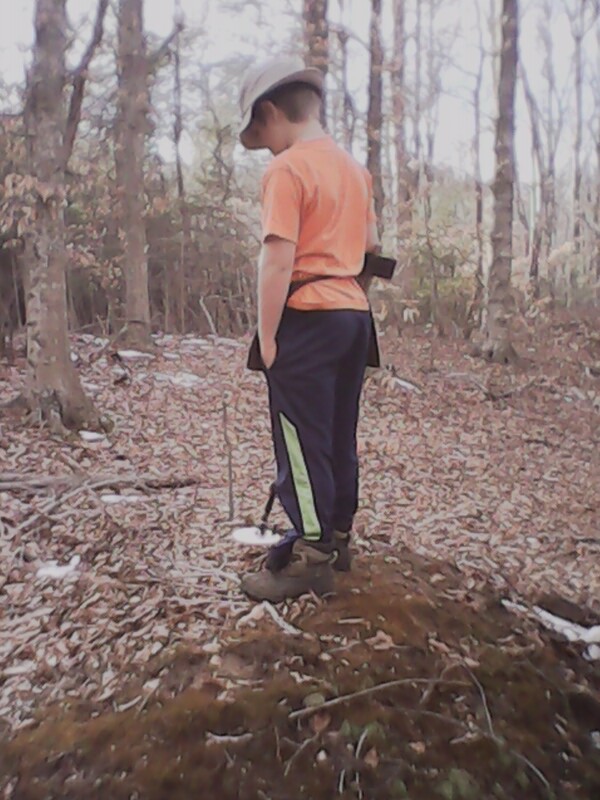 Next on the agenda; using our GPS and metal detector to find the stakes that show us where the boundries are on our property! 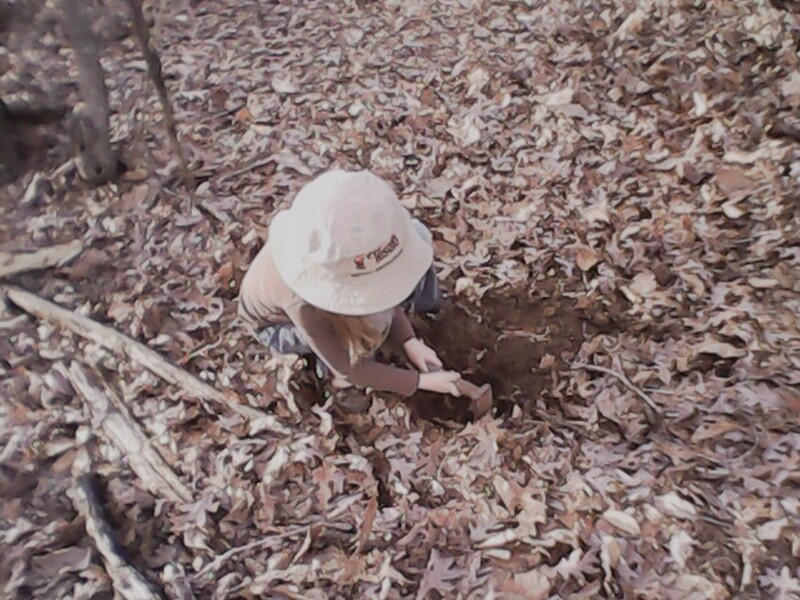 Up until now we've only had a basic idea but now with the new map skills learned in our homeschool and the metal detector, we can be certain once and for all! Disclaimer: Thanks to Tesoro for the above products for the purpose of this review. All opinions stated here are my own. Thank you for hosting this giveaway! What a fun opportunity for learning. We live in an area where it's likely we'd find old relics from major wars in American history, so this would be pretty awesome! My husband just mentioned to me over the weekend that he would love to get metal detectors for our boys! We live in a great area for finding all kinds of relics. Thanks for the opportunity! I'd love to win this for my two sons. They'd really have so much fun with discovering treasurers. I think it might be fun. I have nothing but time and am always very bored. I am 32 and been paralyzed from the shoulders down since I was 23. I am sick of the TV & the computer and wish I had something else to do but currently I do not. My dad also told me he's always thought about it. I think that would be something interesting to share together. Of course, being on disability at a young age doesn't leave much extra money after bills. That's with disabled parents living in my house with me to take care of me and help out with bills. Now I am babbling, sorry. I just think it would be fun and who knows, might find something on my property-which is fairly large! Thanks for the giveaway! I have ALWAYS wanted a metal detector!!! I have borrowed a friends a few times and what total in love! I enjoy finding old cellar holes and exploring! Thanks for the giveaway, always wanted a metal detector. My husband has always wanted one of these, he likes to be outdoors and rock hunt, but would love the chance to treasure hunt. This would be the best family fun or just on days when I'm alone to really have a great hobby! I would love love love a metal detector. I think it would be a fun hobby to share with my nephew. 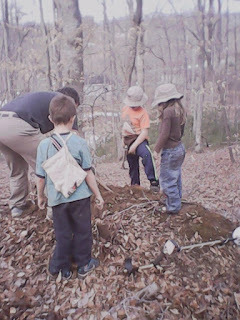 I would like to win so I can search for treasures with my kids. I have wanted a metal detector for a long time. Now that my husband and I are retired, it would be fun to go on detecting journeys! I would love to go treasure hunting with one of these! It'll give us something to do outside now that we are reaching the retirement age! I want to for my nephew. I used to have a metal detector when in school. I found lots of old coins. Strangest thing, I found a metal dog collar. Ends up I dug up where my Mom's dog had been buried in the 50s! Whoops. This would make an absolutely perfect gift for my son - he would LOVE treasure hunting! I would like to use it as a gift. I've always wanted to have some fun with a metal detector. My son is saving for a metal detector and this would be a great surprise for him if I win. I would love to win because I have always been obsessed with old things. I would love to find some old coins or some other old relic. I would love to win this, may daughter has been asking for one of these for over a year now. I just cannot afford it, so hope to win. This reminds me of a happy time when I was young. I would love to win because this would be such a fun activity for the whole family! I would love to win this because my daughter would just love to go out and search for treasures in are back yard. I have always been fascinated by the people who go to the beach with their detectors. Living near the beach, I'd love to go find some treasures of my own. I would love to win this for my son. I continue to show him there is more to life then video games. I think he will find this neat. I would love a metal detector because my husband has one and if I also had one I could metal detect with him when we go to the beach. 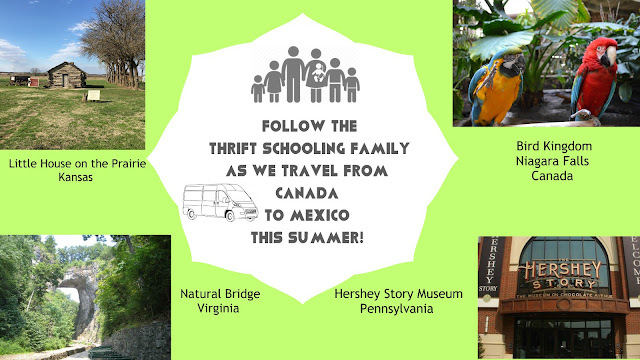 We do a lot of hiking and exploring and this would be great to do with the kids! I would love to win this because we often go fishing in out of the way places and this would be so much fun to try out in those areas. I would love to win this for my husband well whole family really for the last couple years my husband has talked about wanting one to have something different to do with his family and we havent done it yet so I would love to give this to him he deserves it. My family would love this. It would be fun to see what we could find as we go for walks.